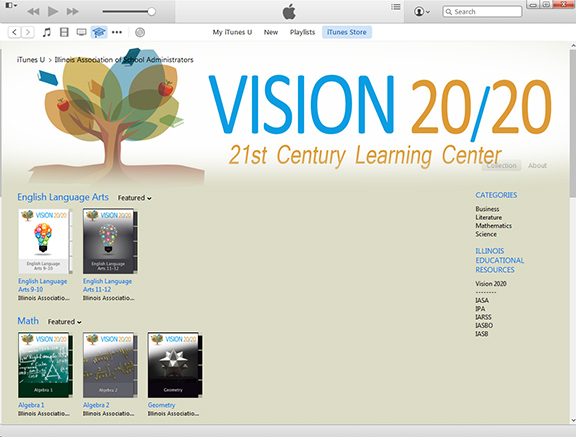 The Illinois Vision 20/20 coalition, in partnership with Apple iTunes U, has launched a new initiative, the Vision 20/20 21st Century Learning Center. The 21st Century Learning Center aims to transform Illinois teaching and learning by providing high-quality digital course content for classroom teachers in the four core content areas of mathematics, science, social studies, and English language. Click here to listen to IASB Executive Director Roger Eddy's response to the announcement. The launch took place today at Township High School District 214 in Arlington Heights with a live simulcast at the Illinois Principals Association in Springfield. Illinois Secretary of Education Beth Purvis attended the unveiling at District 214. State Superintendent of Education Tony Smith joined the event in Springfield. An emphasis on empowering students, facilitating their understanding, and creating engaging experiences prompted Vision 20/20 to launch this initiative. The new repository, available free for Illinois educators, is an open and accessible collection of education resources. It will initially focus on grades 9-12, with expansion for grades K-8 currently in the initial development stages. Resources include lectures, videos, books, and other materials available for high school courses such as Algebra I and II, chemistry, geometry, ELA 9-10, ELA 11-12, economics, biology, and physics. More course options will be added this fall. Educators from 22 school districts across Illinois began meeting earlier this year to choose the digital content and curriculum resources that teachers, students, and families can use to meet Illinois Learning Standards. Content leaders and curriculum specialists then vetted the collection before it was added to the site. iTunes U is the world's largest online catalog of free educational content. It helps educators create and manage courses with lectures, assignments, books, quizzes, and syllabi. Content is available on the iTunes U application, available to Apple operating system (iOS) users around the world. Jeffrey Leathem, an English Language Arts Course Lead from Palatine High School, was a participant in the development of the content. He said he is certain other educators will benefit from the new site. “Never before has information been so readily available for students and teachers to maximize learning and teaching,” Leathem said, as he demonstrated the coursework at the launch. “The 21st Century Learning Center on iTunes U offers anyone involved in Illinois education instant access to digital learning materials that will help facilitate new types of student-centered — and student-driven ― learning experiences that align with new standards in education. 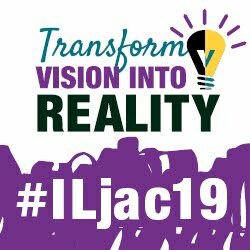 “The best thing is that it’s populated with resources that real Illinois teachers created and curated for use in real Illinois classrooms,” Leathem continued. State Superintendent Smith also talked about the importance of educators working together. For more information on the Vision 20/20 initiative and the 21st Century Learning Center, visit illinoisvision2020.org. Vision 20/20 is a partnership of Illinois education organizations with the goal of “fulfilling the promise of public education. Vision 20/20 has developed a four-pillar action plan to create an education system that meets the needs of all students: retaining highly effective educators, promoting 21st century learning, calling for shared accountability, and developing equitable and adequate funding.